בלוג חריטה ישראלי, בעברית ועל דברים שחשובים / מעניינים לחרט העץ הישראלי. חדשות, ביקורות, וכרטיסים להופעות בסבבה... מאת משה אשל חרט חובב כאן בארץ הקודש. Summary: Enjoyed a day long workshop with Eli Avisera, made a very nice plate for my wife. Last week, on Wednesday I had the opportunity of getting away from work for a day and join for that day, a week long workshop at Eli Avisera's workshop near Jerusalem. The workshop is located at the edge of small village on the Jerusalem mountains with a great view. Eli gives there lessons in woodworking, carving and sculpting, but mainly in woodturning. He has I think 10 lathes lined up for the students each with its own tool stand and accessories, so that there is "line" when you want to do something. I think I mentioned I did my beginner course by Eli, and it was a memorable experience, since then I have went there again a few times to see demos or learn specific techniques (private lessons), and it was always a pleasure. Sharpening is crucial for quality work (and for ease of work). Your skew should be VERY sharp. (I need to say that isn't the first time I heard these things from him, but each time it sinks in a bit better, also this isn't really original material, just very important - except for his signature tools). 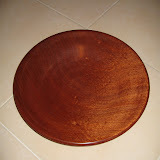 After a break we went on to the days main event: turning a plate, each of us got a nice mahogany blank and made himself a plate (about 12" wide max). Eli demonstrated many techniques to accomplish all aspects of turning the plate (holding, cutting, finishing, different finishes and how to apply them). And each of us went on to do our own thing - it was a lot of fun. we got to talk and discuss many aspects of the trade. After we all finished, Eli did a few more short demonstrations on how to use a Japanese ring chuck (If anyone knows where to get one), also make a lady pen, and eccentric turning using escoullans chuck. עיצוב Picture Window. התמונות בעיצוב צולמו על ידי sndrk. מופעל על ידי Blogger.